Ramada Cornwall: Get a headstart on your resolution in Cornwall! Get a headstart on your resolution in Cornwall! A lot of people will be waiting until January 1 to start trying to get in shape – but by then, gyms will be crowded, and most people will just give up. No, the best thing to do is get out and get active NOW! And why not? Southern Ontario is beautiful at this time of year! Here are some fun things you can do this winter in Cornwall to get a headstart on your New Year’s resolution! Don’t let the name fool you – the Summerstown Trails are great in the winter! That’s because they’re home to some lovingly groomed Nordic skiing trails! 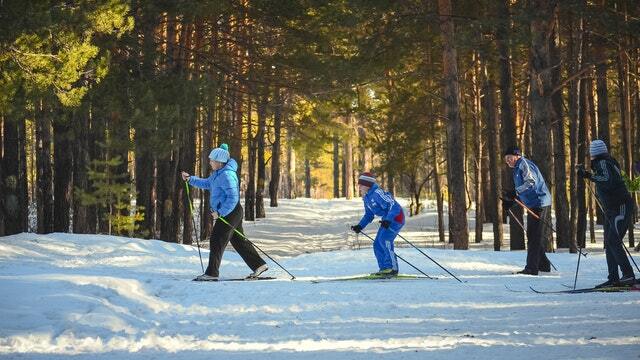 Nordic skiing, also known as cross-country skiing, is one of the best workouts in the world! A full-body cardio exercise, Nordic skiing uses your upper body, your lower body and your core as you work to propel yourself across a gorgeous Winter landscape! While it can be tricky at first, once you get into it it’s almost zen – a calming journey through beautiful winter settings you wouldn’t get to see otherwise! Summerstown boasts over 20 KM of trails that take you through the forests and offer a variety of views and landscapes. Even better, they offer ski rentals as well as lessons for novice skiers! Of course, one of the best things you can do for your body is go for a walk! Cornwall’s historic Lamoureux Park is always stunning in winter, covered in snow and providing a full view of the rushing St. Lawrence River. Take a friend or partner and go for a stroll through the jewel of Cornwall this winter! Planning on a winter getaway? Then stay at the Ramada Cornwall. We’re centrally located and offer incredible comfort for a great price. And, if you’ve spent your day getting in shape in the cold, you’ll appreciate our hotel hotel tub! Book your room today to enjoy a winter wonderland!